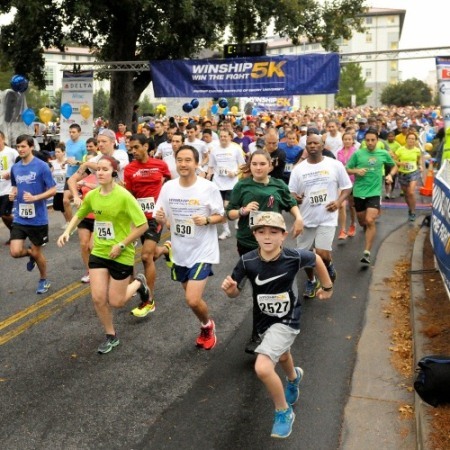 An estimated 3,000 runners and walkers will join John Schuerholz, legendary president of the Atlanta Braves, at the starting line of the Winship Cancer Institute of Emory University (Winship) Win the Fight 5K Run/Walk on Saturday, October 3. Schuerholz, who was successfully treated for prostate cancer in 2014 at Winship at Emory Saint Joseph's Hospital, will serve as grand marshal of the event. WSB-TV reporter Mark Winne will be the emcee for the fourth year in a row. The 5th annual Winship 5K starts and ends at Emory's McDonough Field complex on Asbury Circle and winds through the Druid Hills neighborhood. On-line Registration remains open until September 30th. For the first time, Cox Enterprises has signed on as a presenting sponsor. Other major corporate sponsors include Peach State Freightliner, Delta Air Lines and Arrow Exterminators. The Winship 5K is unique because it allows participants to direct their tax-deductible donations to benefit cancer research in one of 18 different areas including bone marrow transplantation, breast cancer, melanoma, myeloma and sarcoma. For more information on the Winship Win the Fight 5K, log on to winship5K.emory.edu or call (404) 727-6175. Also, like the Winship 5K on Facebook or follow on Twitter.